All our solutions leverage cutting-edge technology, board-honed best practices, and access to our network to provide you with the solution to any board governance matter. ​ Review is a business-based approach to effective governance that ensures board practices and bylaws are aligned. With this bylaw review, you get objective recommendations with limited bias and provides you the opportunity to identify areas where you can address as a Board or seek legal counsel. 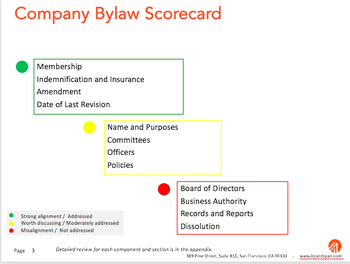 Boardspan’s Corporate Bylaws Review aligns your bylaws with current governance best practices and corporate needs. For most boards, much of the real work gets done in committees. 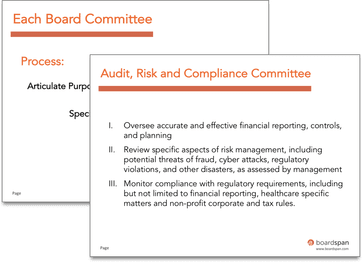 Through this mechanism, board roles are defined, board goals are set, and board results are monitored. Of course, these actions and information should be summarized back to the full board. So it comes down to a judgment call as to how to best leverage board committees, who participates in them, what their accountabilities are and how they interact with management as well as the full board. Boardspan’s Board Board & Committee Structure Review helps boards organize and apply their board talent to the board committees that are most contributory for your organization. We help each committee set goals, identify best practices and establish their deliverables, and then coordinate among the players, so that the board gets the most from its committees.